In 1956, fearing American audiences could not relate to a movie with an all Japanese cast, American producers took a Japanese monster picture named Gojira and strategically inserted actor Raymond Burr playing reporter Steve Martin. 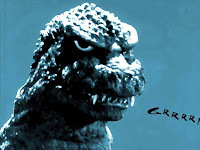 The result was a new film named Godzilla in which Burr reports on all the action in the movie and interacts rather clumsily with the characters from the original footage. 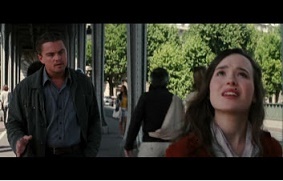 In 2010, the movie Inception directed by Christopher Nolan opened with one of the most complex and confusing plots ever presented in a major American motion picture. To help audiences better comprehend the film, Hollywood moguls had the bright idea to try the Godzilla approach once more. Steve Martin: I was greatly looking forward to seeing my old friend Dominic Cobb again. I'd heard he'd been experimenting with techniques to enter the dreams of other people to extract secret information from them. How fun! My name is Steve Martin. I'm a reporter. Not the comedian. Cut to shot of Cobb looking up. Oddly, whenever Steve Martin's face is seen on camera, you only see Cobb's back. Cobb: Why, Steve! Steve Martin! I haven't seen you since your excellent reportage on the Godzilla rampage in Japan. What can I do for you? Steve Martin: I'd like to do a piece on Inception, the manner in which you implant ideas in people's minds while they sleep. I think I can sell it to Christopher Nolan. Cobb: Great, Steve! We are working for a businessman named Saito to implant an idea in his competitor Fischer to destroy everything Fischer’s father worked tirelessly for all his life. Steve Martin: And what will you gain from this, Dominic? Cobb: I'm wanted for the murder of my hauntingly lovely wife Mal, which I didn't do, and can't get back in the United States to see my two lovely children until Saito arranges for me to get past U.S. Customs. Steve Martin: Sounds like a case for Perry Mason! But tell me, Dominic, how do you know when you are sleeping? Steve Martin: A dreidel? I never knew you were Jewish! Cobb: No, Steve, it's a top which keeps spinning if you are in the dream state and topples over if you are not. By the way, Steve, you are in the dream state right now! Steve Martin: I awoke in my elephant print pajamas needing desperately to go the bathroom, both No. 1 and No. 2. Then I got a call from Cobb telling me to meet him and his new dream architect in a nearby cafe. Cut to shot of Cobb and Ariadne sitting in a cafe talking. Oddly, whenever Steve Martin's face is seen on camera, you only see their backs. Cobb: Ariadne, I'd like you to meet my friend, reporter Steve Martin. Ariadne: Steve! Steve Martin! Nice to meet you. Cobb: Steve, Ariadne will design the multiple dream levels to be dreamed by each of the members of my team. We're somewhat concerned that Fischer's mental projections may battle us, thereby adding a lot of wanton violence to the movie. Steve Martin: Good, I love reporting on wanton violence! And your thoughts, Ariadne? Ariadne: I'm worried that Cobb's projections of Mal will screw up everything, especially if we land in Limbo, the bottom level of dreams where 24 hours of awake time plays out like 50 years, or even longer if you're stuck watching a movie by the Farrelly Brothers. Watch out, Steve, that fruit stand's about to explode on you! Steve Martin: Escaping from the terrible mixed fruit carnage, I joined Cobb and his team aboard a plane with Fischer and Saito. Oddly, whenever my face is seen on camera, you only see their backs. Cobb: Sandman's comin', Steve! Want a drink of water first? Or a story? Steve Martin: I joined the team on their manifold adventures at multiple levels of Fischer's maze-like dream. Cobb told me the only way back to waking state was through a kick, the experience of something horrible like dying in the dream, getting blown to smithereens, or listening to ABBA. Cobb and Ariadne: Watch out, Steve! We're falling into Limbo! Steve Martin: Now it seems Steve Martin, like Tokyo, has no defense! Cobb: Steve, down here we have to finish implanting in Fischer the idea to decimate his father’s legacy, locate Saito who’s now 147 years old, and - by the way - kill Mal. Steve Martin: Sounds like a plan, Dominic. Steve Martin: Cobb and I found Saito wearing a latex mask which made him look like Abe Vigoda’s father. I haven't seen such cheesy special effects since Godzilla! Cobb and Saito killed each other, and I initiated a kick based on some sausage I ate before I went to sleep. Oooohhh!! I still feel it! Steve Martin: And then we were all back on the plane. But was this reality or still a dream? Am I nothing more than a portly unemployed rather bland actor who only dreamed he hit the jackpot with Perry Mason and Ironside? Cobb: Steve, once I get past Customs thanks to Saito why don't you come home with me for lunch? I'll spin the top and we'll figure out whether we're real people or just stuff to sprinkle on oatmeal. Steve Martin: We returned to Cobb's house and were greeted by actor Michael Caine who looks even better than I do, but of course he's not dead! Then Cobb at last saw his children. Cut to shot of Cobb's two young children. When Steve Martin's face is on camera, you only see their backs --- not so oddly, because that’s all you saw of them in the original movie! Cobb's children: Steve! Steve Martin! Word out of Hollywood is that Inception 2013 has bombed so badly that Godzilla has asked his name be taken out of the credits! Oy! This may be the stupidest post he's ever written! What this story lacks in plot line it makes up in great cinematography. The angle and lighting to get those great shots of the actors backs is simply amazing. BTW-did your mom name you after Perry Mason? It begins with excellent casting of course, hiring actors whose backs look remarkably like those of Leonardo di Caprio, Ellen Page, Joseph Gordon-Levitt and everybody else. Then great direction to get marvelous performances out of those backs! Thanks for being one of the few people to respond to this bit, Russell. When I wrote it I thought it was a hilarious concept, someone getting the bright idea to take the same hokey approach used in Godzilla (clumsily inserting Raymond Burr into a low rent monster picture) and applying it to a good movie, i.e. Inception. Only problem: no one else on the planet seems to like it! Alright, no big deal; I love it. It's enough that I'm entertained. I was not named after Perry Mason. 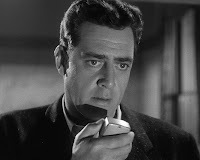 I was named after Raymond Burr. Maybe I should have picked another movie. The Seventh Seal, Featuring Raymond Burr? The Wizard of Oz, Featuring Raymond Burr? Groundhog Day, Featuring Raymond Burr? Damn, all three seem hilarious to me!